This truly is a "60s Supershow" with the original voices of the biggest songs of the decade. 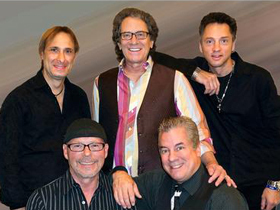 Gary Lewis & The Playboys will have you singing along to "This Diamond Ring," "Everybody Loves A Clown," "Count Me In," "She's Just My Style," "Sealed With A Kiss," and "My Heart's Symphony." Mitch Ryder takes the stage with his incredible rock anthems "Devil With A Blue Dress On," "Good Golly Miss Molly," "Jenny Take A Ride," "Sock It To Me Baby," "Little Latin Lupe Lu," and more rock favorites. Dennis Tufano is the original lead singer of The Buckinghams and will be performing all of his hits including "Kind Of A Drag," "Don't You Care," "Hey Baby They're Playing Our Song," "Mercy Mercy Mercy," and "Susan."